Yemen was mentioned twice in President Barack Obama's State of the Union address on Tuesday, once in respect of the "decisive blows" by American power that had sent al-Qaeda scrambling, and again in respect of the "wave of change" that has broken across the Arab world to demand the "rights and dignity of all human beings." No country is more delicately balanced between the contending pressures of the Arab Spring and Washington's campaign against al-Qaeda. And neither has been advanced by heavy U.S. intervention in the impoverished Arabian nation, as an overriding focus on al-Qaeda continues to define Washington's policy on Yemen's battle over democracy. The departure of the dictator President Ali Abdullah Saleh to the U.S. a week ago is the culmination of a grand bargain between contending factions of the country's political class, brokered by U.S. diplomats, which avoids both genuine elections and accountability for the regime's bloody crackdowns on protestors. Saleh, in power for 33 years, was wounded by a bomb attack in his palace last summer amid an increasingly violent antigovernment uprising. Immunity from prosecution and leave to seek medical treatment abroad, Washington's logic goes, will discourage him from marring Yemen's pro forma election next month of a successor  Saleh's Vice President is the sole candidate. The deal has outraged many of the democracy activists who have pledged to remain camped out in city squares throughout the country. "There shouldn't be any place for tyrants in the free world," TIME was told by Tawakul Karman, who won the Nobel Peace Prize in 2011 for her role in challenging the regime. "This is against all international agreements, laws and covenants," she added. "The entry of Ali Saleh into America is an insult to the values of the American people. This was a mistake by the Administration, and I am confident he will be met with wide disapproval in America. This will tarnish the reputation of America among all those who support the Arab Spring revolutions." Allowing Saleh to stay might be couched as a humanitarian gesture, but it also reflects a realism branded as cynical by Yemeni activists. Yemen's power struggle is far from over, and Saleh may yet emerge victorious if he returns to continue leading the ruling party through his extended family. As Charles Schmitz, a Yemen expert at Towson University in Baltimore, notes, "Saleh's sons are still in command of the armed forces and security apparatus. So, though Saleh is politically a pariah, the U.S. still needs his clan to help fight al Qaeda, and al-Qaeda is the priority in U.S. policy." The regime's efforts against terrorism, however, have been superficial at best. Saleh's government used its position as the local partner in the Bush Administration's "global war on terror" to obtain arms and, more importantly, a veneer of political legitimacy in confronting its domestic adversaries. Last year, the regime diverted its elite U.S.-trained and U.S.-armed counterterrorism force away from its patrols in the restive south to battle opposition tribesmen in Sana'a, the capital. 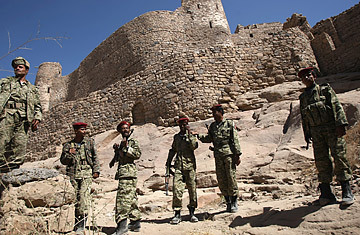 And as the battle for power in the capital has raged, extremism has spread dangerously in Yemen's rugged hinterlands. A group calling itself Ansar al-Sharia, the Partisans of Islamic Law, have capitalized on the erosion of the central government's authority to seize a growing swath of territory. Cutting off hands for larceny and executing soldiers who resist them, their range expanded to within easy driving distance of Sana'a. An armed gang seized the southeastern city of Rada'a last week, raising the flag of al-Qaeda there and decrying a new national unity government as "Jewish." The distraction in the capital has prompted the U.S. to step up its own covert war against al-Qaeda in the Arabian Peninsula, as the movement's local franchise is known. In October, a drone strike killed Anwar al-Awlaki, a U.S. citizen who had been the group's star recruiter and public face. Drone strikes have so far executed mostly lower- and mid-level operatives, but frequently also kill civilians. A separate attack in October killed al-Awlaki's 16-year-old son, also a U.S. national. Limited as it is, few observers of Yemen's complex, bloody politics believed that even the amount of change achieved so far would have been possible. That a society as well armed as Yemen's could avoid Libya's civil war or Syria's grisly breakdown, diplomats insist, signals a triumph of negotiation. The stewardship of the U.S. and its Arab allies over the plan remains a major grievance of the protest movement there, however. Protesters in Sana'a chanted on Thursday: "This is a revolution, not a political crisis!" The early intercession of foreign powers with a transition plan distracted attention from popular demands, they say, and allowed the President to cite ongoing talks in delaying his resignation. Many Yemenis believe the key interest guiding the U.S. has been keeping enough of the regime intact to combat al Qaeda, and that this has distorted the outcome. Saleh, in addressing the U.S. media, works the issue, portraying himself as loyal ally against terrorism. "I am addressing the American public. I want to ask a question: Are you still keeping your commitment in continuing the operations against the Taliban and al-Qaeda?" he said last year, in an interview with TIME. "But what we see is that we are pressured by America and the international community to speed up the process of handing over power." Despite ongoing repression, Saleh has used his relationship with the U.S. to bolster his position. Last July, John Brennan, the Obama Administration's counterterrorism adviser, paid an official visit to Saleh, then on medical leave in Saudi Arabia. The spectacle was broadcast on Yemeni state TV  the sight of the President's good health and statesmanlike demeanor sent loyalist soldiers and tribesmen into riotous celebratory gunfire which deepened tensions. Ultimately, it was a threat of U.N. sanctions that would have sunk the government, paving the way for the current deal. U.N. mediators won all sides' consent to a time line for political transition, which connected Yemen with a wider democratic trend that leaves in flux U.S. reliance on authoritarian Arab states to guard its interests. In Yemen, the U.S. enjoys unrivaled leverage over a brutish yet desperate regime, but remains fearful of what might replace it. Because Yemen is one of the few Arab states in which al-Qaeda operates with much vigor, these days it is also one in which the U.S. struggles to relinquish the long-standing habit of prioritizing security concerns over the promise of democracy.